For other people named John Trevor, see John Trevor (disambiguation). Sir John Trevor (c. 1637 – 20 May 1717) was a Welsh lawyer and politician. He was Speaker of the English House of Commons from 1685 to 1687 (the Loyal Parliament) and from 1689 to 1695. Trevor also served as Master of the Rolls from 1685 to 1689 and from 1693 to 1717. His second term as Speaker came to an end when he was expelled from the House of Commons for accepting a substantial bribe. He is the most recent speaker to be forced out of office. John Trevor was born around 1637 or 1638, the exact date of his birth being unrecorded. His father, also called John Trevor, was the son of Sir Edward Trevor; his mother was Margaret Jeffreys, daughter of John Jeffreys and aunt of the celebrated judge. The family lived at Brynkinalt in the parish of Chirk in the Welsh county of Denbighshire. Trevor was educated at Ruthin School, and he started his career as a clerk for his relative Arthur Trevor. From there he worked his way up with the help of the patronage of another relative George Jeffreys until he was appointed a king's counsel by Charles II. In 1685 he was appointed to the high offices of Master of the Rolls and Speaker of the House of Commons by James II. Being a Tory and a partisan of James II, the accession of William III saw Trevor deprived of his office. In 1690, however, he once again returned to parliament as Speaker. From 1693, he also once again held the judicial office of Master of the Rolls. 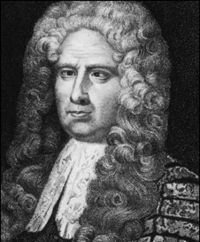 Between 1692 and 1695, he represented Newry in the Irish House of Commons. As Speaker he was memorable for being severely cross-eyed—the affliction was so confusing to members of the House that they were frequently uncertain as to which of them had "caught the Speaker's eye", and would try to speak out of turn. On 7 March 1695, he was found guilty of accepting a bribe of 1000 guineas (£1050, but equivalent to around £1.6 million in 2009) from the City of London to aid the passage of a bill through the house. This was judged to be a "high crime and misdemeanour" and he was expelled from the House of Commons, a move which he initially resisted on the ground of ill-health. He was not asked to refund the bribe and retained his judicial position until his death at the age of 79 or 80 on 20 May 1717. Trevor married Jane Mostyn, the daughter of Sir Roger Mostyn. They are known to have had four children: Edward, Arthur, John and Anne. Trevor's wife predeceased him, dying in August 1704. Through his daughter Anne, Sir John was the ancestor of the Hills, Marquesses of Downshire, the family of Hill-Trevor, Viscounts Dungannon, the Duke of Wellington, and Queen Elizabeth II. ^ a b Lundy, Darryl (1 May 2008). "Person Page – 3657". thepeerage.com. Retrieved 19 May 2009. ^ a b c d e f Jeaffreson, John Cordy (1867). A Book about Lawyers. G.W. Carleton. pp. 106–109. ^ King, Anthony (19 May 2009). "MPs' expenses: even as a scapegoat, Michael Martin is a failure". Daily Telegraph. Retrieved 19 May 2009. ^ "17th Century Speaker's downfall". BBC News. BBC. 19 May 2009. Retrieved 19 May 2009. Wikimedia Commons has media related to John Trevor (speaker).